As I speed down a back road at 71 miles per hour — pushing my luck on a speeding ticket in a 65-mile-per-hour zone, I know — the old barns and sheds and tumbled-down tenant houses flicker by in the corners of the windshield. I can only afford a glance, but I rarely resist the temptation to take a quick look out the side glass. Trees and shrubs have shed their leaves, and in the muted light of a cloudy winter day, I can see deep into corners of fields and hedgerows. 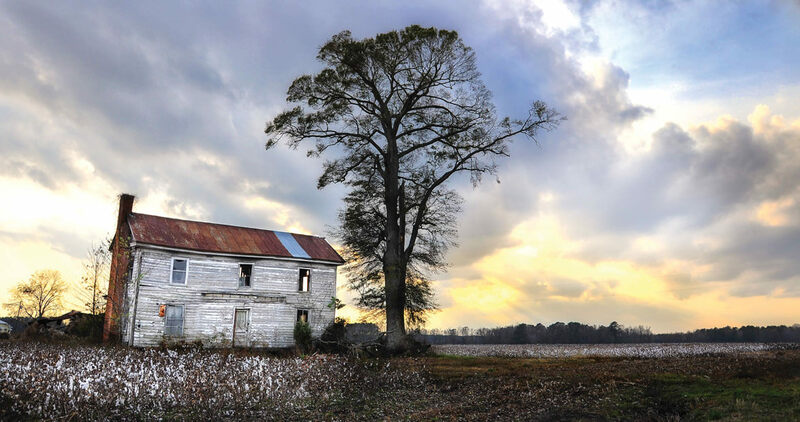 Tobacco barns, pack barns, pole barns, squat little houses with dogtrot porches, multistory farmsteads with broken, sagging rooflines barely visible through the vines — these ramshackle, overlooked farm buildings catch my eye and my spirit and tug at my focus. I’m not always hurtling through the countryside, of course. I’ve passed these old buildings on the way to the farm pond to fish for summer bluegills, on the way to the river to paddle, while running the dog through snowy fields. That’s when these abandoned buildings get closer, longer looks. On my friend Robert Edwards’s farm in Halifax and Nash counties, I pushed through brown stalks of dogfennel and leafless blackberry brambles that tore at my shins for a look inside an old cabin that I’d hiked past for years. Virginia creeper hung from the rusted tin roof. I bent over bare ironwood saplings to make my way to the door. I leaned in and peered into the gloom, shafts of sunlight stabbing through the still air, lighting up motes of dust like stars. Satisfied that there were neither skunks nor a Sasquatch taking refuge from the cold, I stepped up and in. And I wondered what I always wonder when I clamber inside some old, forgotten cabin. Who lived here? How did they spend their days? I took a few careful steps over groaning floorboards to look out an old window slicked with frost and grime. A giant beech tree grew close to the house. Did children swing from the branches? In a house so old, I could only imagine the laughter and tears that those walls had witnessed. Edwards doesn’t have to wonder. A farmer from nearby Whitakers, he’d heard about Humm Vestal, who owned this farm before the Edwards family bought it, years earlier. Edwards remembers Vestal’s wife, Mable, who outlived her husband. “What’s so cool about that old place,” he says, “is that it’s not even the oldest building on the creek.” What I didn’t know at the time was that the old cabin was the youngest of three structures built chockablock on the hillside. A log cabin beside it dated to the late 1800s. And an addition to the original log cabin was built in the 1920s, with a soaring chimney made of rocks pulled from the creek. And in the mortar between the rocks were arrowheads. “Maybe 50 or more of them. Dangdest thing you’d ever seen,” Edwards says. At one time, eight to 10 small farmhouses were scattered across this one farm. Maybe a dozen families made a living here, including Edwards’s grandfather, who owned the only ground he would ever own right there above the creek. When the Edwards family bought the farm, it felt like they were closing a circle of history. Which is how it happens. Quietly, unobserved, the building rots, the timbers fail, the remains are hauled off or set afire. This is the cycle of rural farmsteads — the land is cleared and tilled and gives life and takes life and then the land takes back all that it gave. Vines and brambles climb and cover. Acorns sprout and saplings push through porch cracks and trees split timbers and tin roofs. Steps crumble. Windows ghost over with age. There’s no one to blame. Farmers can’t be expected to pour money into saving an old shell of a pack barn when there’s diesel fuel and family groceries to buy. But I fear that we are at a tipping point for these sentinels of history, and the tipping is both metaphorical and literal. Drive across rural North Carolina, and you’ll see old barns and farmhouses that surely won’t stand another decade. Some look so decrepit that they might crumble in your rear-view mirror. So I slow the car and look closer. These old tenant houses and curing barns remind us that the land — even rural, remote land — has a human history. Choked with briars and cedars and vines, they might seem to be home to little other than foxes and field sparrows. But memories live there. And as long as those buildings are still standing, they have something to say, at least to me: Slow down. Let your eyes linger. Leave some part of your story behind, for we all are but a part of the sweep of time. Every old tilting farmhouse seems an admonishment. A warning: This world always seems to ask that we move a little faster than we’d like.